THE long history of violent land conflicts in Brazil, resulted in several organisations and landless peoples’ movements calling for agrarian land and social reforms. The first statute that regulated landowning in independent Brazil was the Landed Property Act (Lei de Terras) or Law number 601, enacted on September 18 1850. Historically, the Lei de Terras followed from colonial times in favour of large landholdings by means of massive land grants to well-placed people, usually worked by slaves. The Landed Property Act was drafted during the transition from the colonial administration, based on Portuguese feudal law, in which property depended on both Crown’s grants (sesmarias) and primogeniture (morgadio), to a national independent Brazilian middle-class state. The law established that land had to be purchased, either from the state or a previous private owner. The preservation of such a policy required large scale concentration of land, much as the local commercial farms. This created serious difficulties for peasants and small-scale planters to access land or exercise ‘squatters’ rights’ in order to practice subsistence agriculture as well as small-scale farming that became one of the hallmarks of modern Brazilian social history. In view of the fact that Brazilian landowning management was tied to the specific interests of a single class since 1850, the Brazilian ruling class and political elite actively opposed any attempts at land reform that threatened their social and political power. During the 19th and early 20th Century, opposition to existing property structures, centred on earlier ideologies of the social order, was undertaken by movements led by rogue religious leaders outside the established Catholic hierarchy, viewed by society as ‘heretical’ and ‘revolutionary’. 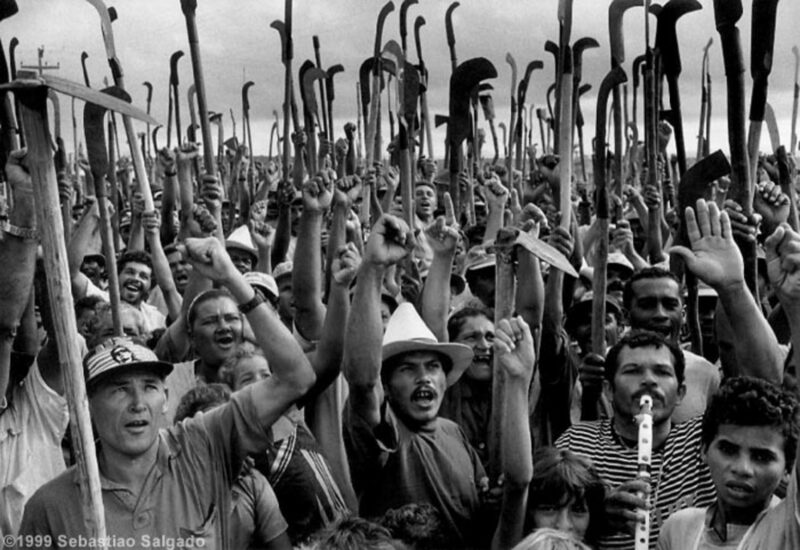 During the 1960s, Brazil had to contend with the rise of various movements that aimed to achieve land reform through legal means. This began with the organisation of peasant leagues (ligas camponesas) in north-eastern Brazil that opposed peasants being evicted from rented plots and the conversion of vast forest plantations into agricultural business and cattle ranches at the cost of the rural poor. The collapse of peasant leagues in the wake of the 1964 Brazilian coup d’état opened the way for unabated takeover of land for commercial agriculture and its ensuing concentration of landowning wealth that proceeded throughout the Brazilian military dictatorship resulting in the decline of rural populations during the 1970s. By the mid-1980s, from a total of 370 million hectares of farm land, 285 million hectares (77 percent) were held by latifundia. It was the military dictatorship’s intention to use land reform as a policy tool in order to develop a section of conservative small-scale farmers as a buffer between latifundia owners and the rural proletariat. Between the late-1980 and early 1981, over 6 000 landless families that included some 600 households had been expropriated and dislocated from their land in 1974, from neighbouring Passo Real for the construction of a hydroelectric dam, as happened at Kariba in Zimbabwe the 1950s. This first group was later joined by an additional 300 and more households which had been evicted from the Kaingang Indian Reservation in Nonoai, where they had been renting plots of land since 1968. With the support of civil society, including the progressive branch of the Catholic Church, the families resisted a blockade imposed by military force. The emergence of landless workers’ movement — Movimento dos Trabalhadores Sem Terra (MST) — in Brazil, during the 1990s, led to a first ‘wave’ of land occupations during 1995 to 1999, when land occupations began in Zimbabwe. The Movement was officially founded in January 1984, as Brazil’s military dictatorship came to an end. Its establishment was firmly connected with Catholic Church-based organisations such as Pastoral Land Commission, which provided support and infrastructure. In the long history of the Brazilian land question, the formation of the MST was the most effective land reform movement in Brazil. Generally regarded as one of the largest in Latin America, it had an estimated informal 1,5 million membership in 23 of Brazil’s 26 states. Its aims were to fight for poor workers in Brazil to have access to the land through land reform and through engagement regarding social issues that impacted on the achievement of land possession, such as unequal income distribution, racism, sexism and media monopolies. It strove to achieve a social covenant by providing a self-sustainable way of life for the poor in rural areas. From the start, the MST took upon itself the task of achieving land reform by: “…breaking … dependent relations with parties, governments and other institutions…” while dealing with the struggle for land.